Gamers are about to be exploring the diversities of a gem filled universe when they partake in these 5 reels of action from Blueprint Gaming. 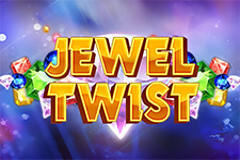 Jewel Twist is a slot based on the simple dynamics of traditional casino games, and yet it brings high energy with it whenever you spin those reels. Soon to be a firm favourite of yours, we can’t think of a better way to pass the time. Presented in a 3x5 network of images, against a wash of subtle colours, this interface is one that definitely captures the imagination. Rather than giving you a set theme to work with, the tone is vague and so you can apply your own individuality onto the matrix. We love that Blueprint Gaming have made such a well rounded real cash slot, for so many other providers fail to do so. One other brand that goes out of their way in an attempt to deliver high quality slots is Octavian, the minds behind the 10 winlines game of Fusion Power. Although utilising a contrasting aesthetic and idea, when these two slots are placed side by side, there’s a lot of similarities that can be found. They both have medium to high volatility with lower level variety, and they have a very plain paytable with which to engage. In an industry that bombards us with more quirky and weird gaming options everyday, it’s most refreshing to see a couple of companies still driving home the importance of old school style gaming. What is more, they demonstrate how retro inspiration doesn’t have to mean boring gameplay. Jewel Twist isn’t simply called that because of the gemstones, it’s also referring to the main feature of the entire game: the twist symbol. This isn’t a paying symbol and so no awards are listed alongside it, but when it appears it can alter the course of the game in seconds flat. The reason for this is that it has the ability to transform into another symbol, much like how a caterpillar becomes a butterfly. A lot of the time you won’t land these icons, such are their rarity, but when you do all those present will change into one of the other paytable tiles. There’s no telling which form it’ll take, so the payouts can vary greatly, however that doesn’t stop the feature from being interesting. We like that it’s a basic idea, yet when put into practice it looks out of this world. In a stark contrast to the basic nature of the special extra, the betting system of Jewel Twist is a lot more varied, thus allowing for many players to engage with the title. Far too many online slots limit their gameplay to a select few, ensuring that only high rollers can get the goods, but that doesn’t happen here. The starting point is a mere 0.10 and that covers the entire grid, whereas the top amount is much more startling 500 credits. You may be wondering what the point of spending that much money is, well it has a lot to do with the returns you stand to gain. Jewel Twist is all about delivering large amounts of money, a factor you won’t be aware of unless you bet big - their paytable increases as your wager does. For us we find it a love-hate technique, for it excludes some customers by default due to their lack of funds. Yet on the other hand, it helps set the bar between casual and advanced gaming, and so the feature has merit too. We enjoy the simplicity that we can find here, for it allows us to clear our heads and yet it engages us at the same time. That being said, we can’t help but feel that Blueprint Gaming could have done more to spice up those reels, even by just adding some free games. A jam packed paytable isn’t needed to create a good slot, but it helps to have more variance rather than a lack of it.